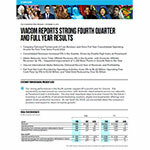 NEW YORK--(BUSINESS WIRE)--Viacom Inc. (NASDAQ:VIAB, VIA) today reported financial results for the quarter and fiscal year ended September 30th, 2018. 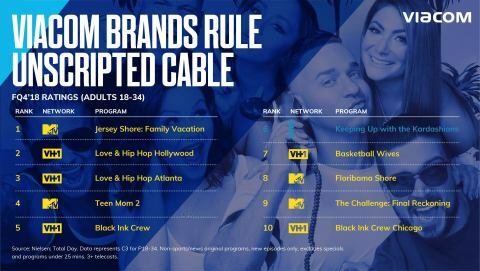 For more information on Viacom and its businesses, visit www.viacom.com. 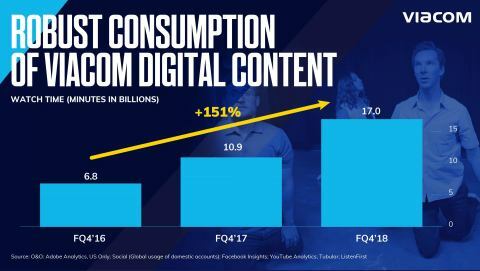 Viacom may also use social media channels to communicate with its investors and the public about the company, its brands and other matters, and those communications could be deemed to be material information. 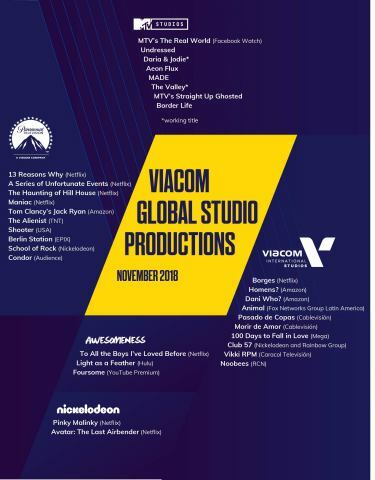 Investors and others are encouraged to review posts on Viacom’s Twitter feed (twitter.com/viacom), Facebook page (facebook.com/viacom) and LinkedIn profile (linkedin.com/company/viacom). This news release contains both historical and forward-looking statements. All statements that are not statements of historical fact are, or may be deemed to be, forward-looking statements. Forward-looking statements reflect our current expectations concerning future results, objectives, plans and goals, and involve known and unknown risks, uncertainties and other factors that are difficult to predict and which may cause future results, performance or achievements to differ. These risks, uncertainties and other factors include, among others: technological developments, alternative content offerings and their effects in our markets and on consumer behavior; competition for content, audiences, advertising and distribution in a swiftly consolidating industry; the public acceptance of our brands, programs, films and other entertainment content on the various platforms on which they are distributed; the impact on our advertising revenues of declines in linear television viewing, deficiencies in audience measurement and advertising market conditions; the potential for loss of carriage or other reduction in the distribution of our content; evolving cybersecurity and similar risks; the failure, destruction or breach of our critical satellites or facilities; content theft; increased costs for programming, films and other rights; the loss of key talent; domestic and global political, economic and/or regulatory factors affecting our businesses generally; volatility in capital markets or a decrease in our debt ratings; a potential inability to realize the anticipated goals underlying our ongoing investments in new businesses, products, services and technologies; fluctuations in our results due to the timing, mix, number and availability of our films and other programming; potential conflicts of interest arising from our ownership structure with a controlling stockholder; and other factors described in our news releases and filings with the Securities and Exchange Commission, including but not limited to our 2018 Annual Report on Form 10-K and reports on Form 10-Q and Form 8-K. The forward-looking statements included in this document are made only as of the date of this document, and we do not have any obligation to publicly update any forward-looking statements to reflect subsequent events or circumstances. If applicable, reconciliations for any non-GAAP financial information contained in this news release are included in this news release or available on our website at www.viacom.com. The following tables reconcile our results of operations reported in accordance with accounting principles generally accepted in the United States of America (“GAAP”) for the quarter and year ended September 30, 2018 and 2017 to adjusted results that exclude the impact of certain items identified as affecting comparability (non-GAAP). We use consolidated adjusted operating income, adjusted earnings from continuing operations before provision for income taxes, adjusted provision for income taxes, adjusted net earnings from continuing operations attributable to Viacom and adjusted diluted earnings per share (“EPS”) from continuing operations, as applicable, among other measures, to evaluate our actual operating performance and for planning and forecasting of future periods. We believe that the adjusted results provide relevant and useful information for investors because they clarify our actual operating performance, make it easier to compare Viacom’s results with those of other companies and allow investors to review performance in the same way as our management. 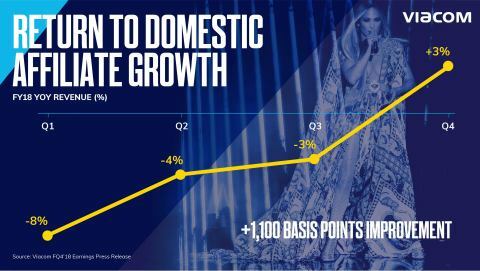 Since these are not measures of performance calculated in accordance with accounting principles generally accepted in the United States of America, they should not be considered in isolation of, or as a substitute for, operating income, earnings from continuing operations before provision for income taxes, provision for income taxes, net earnings from continuing operations attributable to Viacom and diluted EPS from continuing operations as indicators of operating performance, and they may not be comparable to similarly titled measures employed by other companies. (1) The tax impact has been calculated by applying the tax rates applicable to the adjustments presented. (2) During 2018, we launched a program of cost transformation initiatives to improve our margins, including an organizational realignment of support functions across Media Networks, new sourcing and procurement policies, real estate consolidation and technology enhancements. 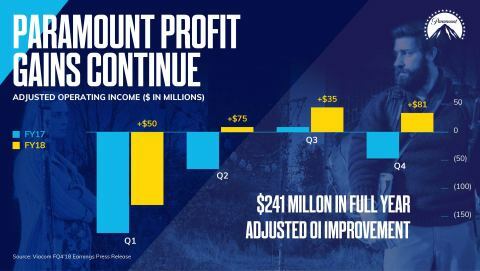 We recognized pre-tax restructuring and related costs of $25 million and $225 million in the quarter and year ended September 30, 2018, respectively. (3) The net discrete tax benefit in the quarter ended September 30, 2018 was principally related to the recognition of certain loss carryforwards. In addition to the items in the quarter, the net discrete tax benefit in the year ended September 30, 2018 was principally related to tax reform, as well as a tax accounting method change granted by the Internal Revenue Service. The net discrete tax benefit in the quarter ended September 30, 2017 was principally related to the recognition of foreign tax credits realized on the distribution of certain securities to Viacom’s U.S. group. In addition to the items in the quarter, the net discrete tax benefit in the year ended September 30, 2017 included the reversal of a valuation allowance on capital loss carryforwards in connection with the sale of our investment in EPIX and the release of tax reserves with respect to certain effectively settled tax positions. (4) We redeemed senior notes and debentures totaling $1.039 billion in the year ended September 30, 2018. As a result, we recognized a pre-tax extinguishment gain of $25 million. We redeemed senior notes and debentures totaling $3.3 billion in the year ended September 30, 2017, As a result, we recognized a pre-tax extinguishment loss of $20 million. (5) We completed the sale of a 1% equity interest in Viacom18 to our joint venture partner for $20 million, resulting in a gain of $16 million in the year ended September 30, 2018. (6) We recognized impairment losses of $46 million in the year ended September 30, 2018 and $10 million in the year ended September 30, 2017 resulting from the write-off of certain cost method investments. 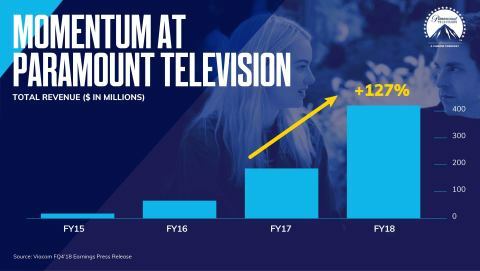 (7) We recognized pre-tax restructuring and programming charges of $381 million in the year ended September 30, 2017, reflecting $237 million of restructuring charges and $144 million of programming charges resulting from the execution of our flagship brand strategy and strategic initiatives at Paramount. (8) In the quarter and year ended September 30, 2017, a consolidated entity completed the sale of broadcast spectrum in connection with the FCC’s broadcast spectrum auction. The sale resulted in a pre-tax gain of $127 million, with $11 million attributable to the noncontrolling interest. We also completed the sale of our 49.76% interest in EPIX in the year ended September 30, 2017, resulting in a pre-tax gain of $285 million. The following table reconciles our net cash provided by operating activities (GAAP) for the quarter and year ended September 30, 2018 and 2017 to free cash flow and operating free cash flow (non-GAAP). We define free cash flow as net cash provided by operating activities minus capital expenditures, as applicable. We define operating free cash flow as free cash flow, excluding the impact of the cash premium on the extinguishment of debt, as applicable. Free cash flow and operating free cash flow are non-GAAP measures. Management believes the use of these measures provides investors with an important perspective on, in the case of free cash flow, our liquidity, including our ability to service debt and make investments in our businesses, and, in the case of operating free cash flow, our liquidity from ongoing activities.